About six years ago, artist Jason Shulman began taking ultra long exposure photographs of news coverage from the morning of September 11th, curious to see if the resulting images would distill something representative of his own memories of that day’s news coverage. While using a similar process in 2014 to study the motion of athletes at the Sochi Winter Olympics, Shulman became curious about using the same technique with feature-length films. 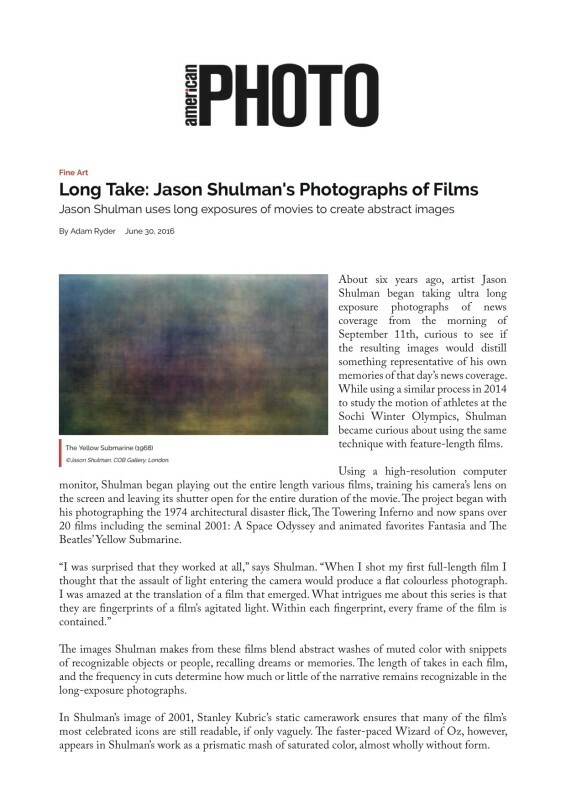 Using a high-resolution computer monitor, Shulman began playing out the entire length various films, training his camera’s lens on the screen and leaving its shutter open for the entire duration of the movie. The project began with his photographing the 1974 architectural disaster flick, The Towering Inferno and now spans over 20 films including the seminal 2001: A Space Odyssey and animated favorites Fantasia and The Beatles' Yellow Submarine.